Keen to be wined and dined at Blues restaurant in Camps Bay? 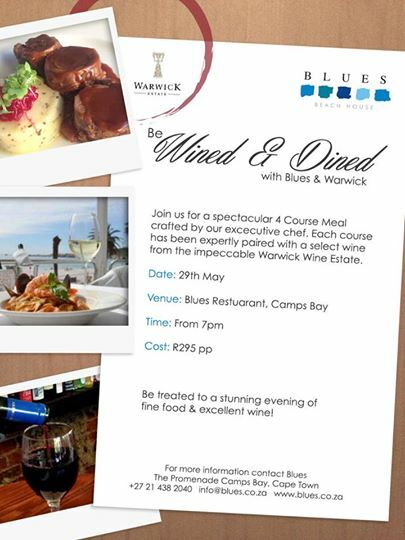 Blues restaurant in Camps Bay have teamed up with Warwick Estate to to create a delish four-course meal paired with the perfect vino. You can check out the full menu on Blues’ Facebook page but you’re looking at canapes on arrival, a tuna and grilled artichoke starter, a choice of pork belly or crusted linefish served with a decadent seafood stew and a lemon creme brulee tart to finish. That’s good value right there, darlings. I’m sooo looking forward to going this Thursday and will be sure to wear my stretchy pants. If you want to join me, you can book your ticket over here.